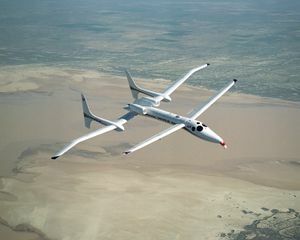 The Scaled Composites Model 281 Proteus is a tandem-wing high-endurance aircraft designed by Burt Rutan to investigate the use of aircraft as high altitude telecommunications relays. The Proteus is actually a multi-mission vehicle, able to carry various payloads on a ventral pylon. An extremely high-efficiency design, the Proteus can orbit a point at over 65,000 feet (19,800 m) for more than 18 hours. It is currently owned by Northrop Grumman. Proteus has an all-composite airframe with graphite-epoxy sandwich construction. 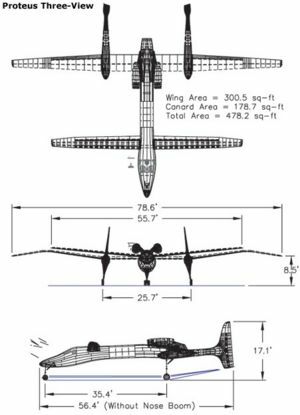 Its wingspan of 77 feet 7 inches is expandable to 92 feet with removable wingtips installed. Proteus is an "optionally piloted" aircraft ordinarily flown by two pilots in a pressurized cabin. However, it also has the capability to perform its missions semi-autonomously or flown remotely from the ground. Under NASA's Environmental Research Aircraft and Sensor Technology (ERAST) project, NASA's Dryden Flight Research Center assisted Scaled Composites in developing a sophisticated station-keeping autopilot system and a satellite communications (SATCOM)-based uplink-downlink data system for Proteus' performance and payload data. The Proteus wing was adapted for use on the Model 318 White Knight carrier aircraft, which is the launch system for Rutan's Tier One spacecraft and the DARPA X-37. Flight testing of the Proteus began with its first flight on July 26, 1998 at the Mojave Airport and continued through the end of 1999. In June, Proteus was deployed internationally for the first time, debuting at the Paris Air Show. It was flown non-stop from Bangor, Maine to Paris. During the week-long show, it flew each day, demonstrating its capabilities as a telecommunications platform. The Proteus is the current holder of a number of FAI world records for altitude (class: C1-e: landplanes 3,000-6,000kg, Group: 3, turbojet), set in cooperation with NASA Dryden . The highest altitude achieved was 63,245 feet, in October, 2000. Proteus was included in the list of the "100 Best of the Century", Time Magazine, April 1999. Due to the multimission nature of the aircraft, it has been involved in a number of significant research projects and missions. Northrop Grumman actively markets the aircraft as a research platform, and has published a user's guide for planning proposed missions. Proteus was originally conceived as a high-altitude, long operation (HALO) telecommunications platform. Proteus was to be the first of a series of aircraft built by Scaled Technology Works of Montrose, Colorado (a proposed spinoff of Scaled Composites which was later cancelled). The aircraft was intended to carry a 14-foot antenna, which was flight tested in the fall of 1999 and the summer of 2000, including the relay of a video conference while the aircraft orbited over Los Angeles. The project failed to move forward, however, and the subsequent series aircraft were not built. A small Airborne Real-Time Imaging System (ARTIS) camera, developed by HyperSpectral Sciences, Inc., under NASA's ERAST project, was demonstrated during the summer of 1999 when it took visual and near-infrared photos from Proteus while it was flying high over the Experimental Aircraft Association's AirVenture 99 Airshow at Oshkosh, Wisconsin. The images were displayed on a computer monitor at the show only moments after they were taken. Then, in September and October 2000, during the Water-Vapor Intensive Operating Period, Proteus and NAST flew validation flights studying upper tropospheric water vapor and performing underflights of the Terra satellite. As part of the TRACE-P (Transport and Chemical Evolution over the Pacific) mission, Proteus once again carried the NAST pod during March, 2001. The aircraft logged 126 flight hours, and was variously based out of Alaska, Hawaii and Japan, gathering data in coordination with ground, balloon and satellite sensor packages over the North Pole in March, 2001. Proteus took part in the NASA Chesapeake Lighthouse & Aircraft Measurements for Satellites (CLAMS) program in July and August 2001, flying out of NASA's Wallops Flight Facility. The project used a number of different aircraft to develop methods of measuring ocean characteristics, and estimates of aerosols. In February, 2002, Proteus carried a 30-foot long pod which served as a target for development of the Airborne Laser system. The pod housed an array of over 2000 small holes containing optical sensors to detect the laser system. In March 2002, NASA Dryden, in cooperation with New Mexico State University's Technical Analysis and Applications Center (TAAC), the FAA and several other entities, conducted flight demonstrations of an active detect, see and avoid (DSA) system for potential application to unmanned aerial vehicles (UAVs) out of Las Cruces, New Mexico. This was a part of the NASA ERAST Project. Proteus was flown as a surrogate UAV controlled remotely from the ground, although safety pilots were aboard to handle takeoff and landing and any potential emergencies. Three other aircraft, ranging from general aviation aircraft to a NASA F/A-18, served as "cooperative" target aircraft with an operating transponder. In each of 18 different scenarios, a Goodrich Skywatch HP Traffic Advisory System (TAS) on the Proteus detected approaching air traffic on potential collision courses, including several scenarios with two aircraft approaching from different directions. The remote pilot then directed Proteus to turn, climb or descend as needed to avoid the potential threat. In April 2003, a second series of flight demonstrations focusing on "non-cooperative" aircraft (those without operating transponders), was conducted in restricted airspace near Mojave, California., again using the Proteus as a surrogate UAV. Proteus was equipped with a small Amphitech OASys 35 GHz primary radar system to detect potential intruder aircraft on simulated collision courses. The radar data was sent directly to the ground station as well as via an Inmarsat satellite system installed on Proteus. A mix of seven intruder aircraft, ranging from a sailplane to a high-speed jet, flew 20 scenarios over a four-day period, one or two aircraft at a time. In each case, the radar picked up the intruding aircraft at ranges from 2.5 to 6.5 miles, depending on the intruder's radar signature. Proteus' remote pilot on the ground was able to direct Proteus to take evasive action if needed. 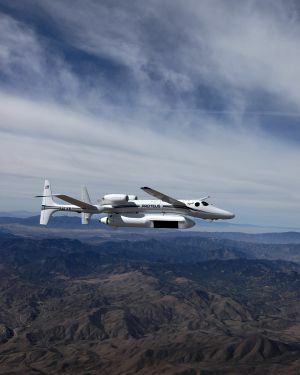 Proteus has been used in a number of deployments as a part of a project sponsored by the DOE's Atmospheric Radiation Measurement program and the Sandia National Laboratories to study cirrus clouds in the upper atmosphere. During these flights, the aircraft was equipped with over 20 sensors mounted on five different parts of the aircraft. In November 2002, Proteus participated in another phase of the project, flying from Ponca City. In October, 2004, Proteus operated out of Fairbanks, Alaska , and in February, 2006, the aircraft was deployed to Darwin, Australia. Northrop Grumman is using the Proteus to research new UAV technologies, as it can be controlled from the cockpit, a ground control station, or operate semi-autonomously. Scaled, in partnership with Northrop Grumman, is offering a fully unmanned version of the Proteus, labeled Model 395, as part of the competition for the USAF Hunter-Killer competition. If selected, that product would fly in 2007. On April 27, 2006, Proteus flight tested a large pod designed house a developmental version of the Multi-Platform Radar Technology Insertion Program, or MP-RTIP. This is a long range, high resolution air-to-ground and air-to-air synthetic aperture radar system being developed for use on the RQ-4 Global Hawk. This pod is, by function of its length and frontal area, one of the largest payloads carried by Proteus to date. Actual flight testing of the MP-RTIP system began in late September, 2006, with initial flight reaching 100 knots and 22,000 feet altitude. "Northrop begins flight testing of new radar technology for Global Hawk", Aerotech News and Review, July 21, 2006. This page was last edited on 7 March 2007, at 22:50.